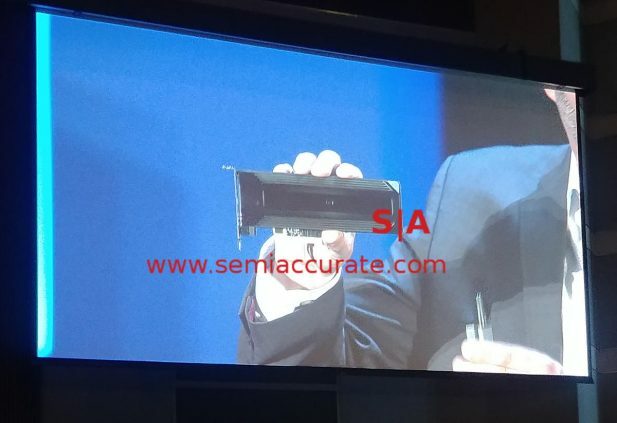 During the Intel Computex keynote they introduced multiple new product lines from SSDs to form factors, high-end X-Series to the ‘next gen’ Core. It sounded good but the details given out during the show were limited to the core counts of the X-Series, 12 and 18. The rest had zero, and we mean none, of the technical detail people actually care about. On the technical front the new X-Series, now with i9 branding, have three variants. First there is the mainstream Skylake-E lines with 6/8/10 core variants. This is the follow on to the late and unloved Broadwell-E parts which are causing Intel a bunch of inventory control and channel headaches at the moment. All are 140W parts from the XCC die chop. If you don’t have the Sky-E/EP details in front of you, XCC is the smallest die running to 10-core, HCC is the middle with up to 18-cores, and LCC is the big one with a max of 28-cores. Intel is getting smarter this time around with Sky-E. With Broadwell-E the 6-core was the obvious best part, it was cheaper, clocked higher, and didn’t have any down sides compared to the bigger parts. The others were demonstrably worse in just about every aspect bar the contrived and laughable scenarios Intel concocted to ‘prove’ the value of more cores. Megatasking didn’t pass the sniff test unless you know people who want to encode video slowly while using more energy on CPU cores vs faster, better quality, and more efficiently on a GPU. This time around Intel is showing they can learn from their mistakes, and by mistakes we mean they allowed the user to get a useful part at a non-painful price. With Sky-E if you look at the stats, the 8-core i7-7820X is the one to buy. Why? At $599 it is far cheaper than the $999 10-core 7900X but clocks 300MHz faster than the 10-core and 100MHz faster than the 6-core 7800X. It is the obvious consumer choice. Or at least it would be if you don’t look at the next few columns. Faced with enthusiasts who might actually understand what they are buying and not just plunk down 4-digit dollars for a slower part, Intel leapt into action and kneecapped the 6 and 8-core parts. How? They castrated the PCIe lanes to 28 vs the 44 on the bigger 10-core variants. Please note that the die in Xeon form has 48 PCIe3 lanes so even the 44 is a crippling. Intel is saying in no uncertain terms that their highest end gaming part, the X which stands for Extreme series, can’t have a full bandwidth second GPU attached unless you but a $999 part! If you think the company cares one bit about their gaming customers, this should shatter those illusions. A high-end gamer part that can only support one GPU at full bandwidth? What can I say, this is so sad it isn’t worth mocking. Please note that AMD does not artificially cripple Ryzen in any way. But just when you think things can’t get dumber we come to the 4-core variants, Kaby lake on Socket 2066. The ‘high’ end 7740X has 4-cores and 8-threads while the lesser 7640X has only 4-threads. Yup they killed HT because, well, there isn’t a good reason other than to jack buyers. They love the enthusiasts, really, they will say so. This is one of those situations your mother taught you about, watch what they do and not what they say. Back to the point whomever greenlighted this Kaby-X line should be fired. Why? The Socket 2066 platform has 4 channel memory and up to 44 PCIe3 lanes. Kaby-X has two memory channels and 16 PCIe3 lanes. Motherboards support both so if you buy a Socket 2066 board and plug a Kaby-X into it, half your memory slots don’t work. 28/44ths of your PCIe channels are likewise MIA which means at least one slot will be dead, likely more. This is a recipe for returns and a very annoyed channel. Even if Intel sells through OEMs they will still have customers who see empty memory slots and go out and buy an upgrade only to find it doesn’t actually work. Kaby-X is not only a bad product it is a marketing disaster. And it is more expensive than just buying a non-X Kaby part. There is no upside to this turkey. That brings us to the big parts, the 12/14/16/18-core variants. They are not only so awesome they transcend the i7 name and force an i9 badge but the top part is now an XE! Yes the i9-7960X was all that could be contained with an X suffix, the 18-core i9-7960XE was needed to convey the awesomeness of this $1999 turkey. The specs on these new cores are not announced but in an earlier slide Intel says 140W and 160W parts so at least we know they increased the TDP to accommodate the HCC dies. Everything else is left blank as you can see above. And they are going to be shipping months after the i7-X parts. It is almost like AMD caught Intel with their pants down when they announced the 16-core Threadripper. That would be a cynical interpretation however, fully backed up by the last set of Intel roadmaps released which did not have the 12+ core variants on it anywhere. What you can say about them is that the 12-18 core models will be slower, more expensive, and consume more energy than the 6-10 core models. There is no reason to buy these i9 models, they will be worse than the smaller parts in every way when gaming, and AMD’s Threadripper should crush them for far less money. Going back to the keynote Intel announced a second gen 3D NAND family with an M2 and U2 SSD bearing them. What geometry? Not disclosed. What capacity? Not disclosed. Endurance? Not disclosed. Availability? Not disclosed. Any reason to care? Not disclosed. Not content to let the CPUs take all the low points Intel went on to talk about Xpoint aka Optane. They once again showed the unethical and contrived Xpoint caching demo with HDD based systems. Last time they did this kind of demo SemiAccurate said the company crossed an unacceptable ethical line. This time around they did it for a live audience. The underlying technology, Xpoint, still doesn’t work right but you won’t hear that from sites that take Intel ads. 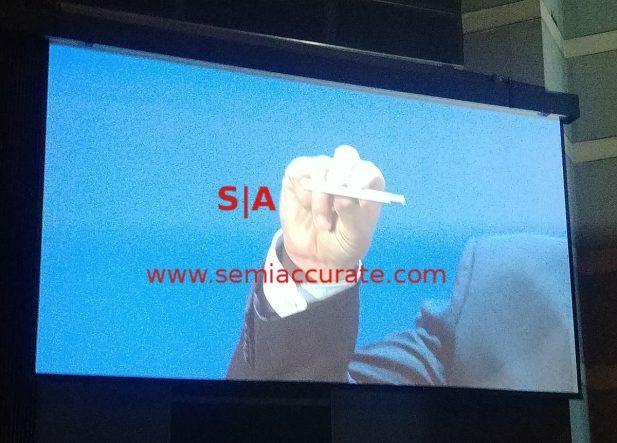 About half of the press at Computex that SemiAccurate has talked to has killed an Optane drive but for some reason they don’t write it up. Money does talk. The big announcement is that Intel took a P4800X, scrubbed the labeling off of it, and said they were launching a consumer drive based on Xpoint. Sometime. Without specs, capacity, or any details. There is going to be a long lag from Computex until launch but based on the reports SemiAccurate is getting at the moment, Xpoint won’t meet endurance targets by then either. Avoid this one too. Last up we have what sounds like a great idea, Intel’s compute card. Take a PC and put it into a cell phone sized case with a proprietary interface. Then plug it into a dock and you have an instant PC which you can pull out and put into any other dock in different form factors. It disaggregates compute from the other functions on a device, a really good idea on the surface. For specs it comes with CPUs from celerons to i7s but given the thermal constraints of the platform, don’t expect high clocks, more than 2C, or graphics that can power a screen more than 1080p. 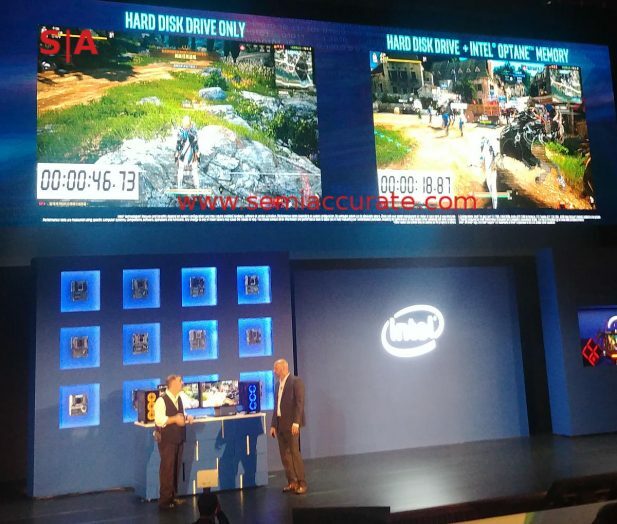 That said Intel gave out zero other details. The problems, other than the crippling thermals, are numerous. Most important here is the proprietary interface, don’t expect docks to be cheap or numerous, but the idea of disaggregating compute from other functions is compelling. Then again you can do the same thing with a USB-C cable bearing DP alt-mode capabilities. It would be cheaper, more universal, and better in almost every way. The form factors and thus thermals wouldn’t be locked in so higher speeds, more storage, and more memory are possible. In general a USB-C/DP alt-mode connector would be a win in every category versus the compute card. Still it is nice to see a new form factor from Intel even if it seems aimed at user lock-in more than user enablement.